Be the first to share your favorite memory, photo or story of Gavin. This memorial page is dedicated for family, friends and future generations to celebrate the life of their loved one. 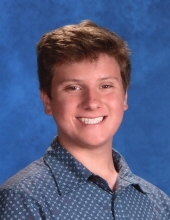 Gavin C. Blank, 15, died early Monday morning, November 18, 2018 in Lanesville, Indiana. He was born to Christopher Blank and Wayneda Gayle DuPont Blank in New Albany, Indiana on December 3, 2002. He was a sophomore at Lanesville High School. He is survived by his father, Christopher (Sharon) Blank, mother, Wayneda Gayle (Denise McCreary) DuPont Blank, his sister, Skyler Blank of Lanesville, Grandparents, Irene & Ray Block, Gerald & Debra Blank of Lanesville, Jean DuPont of Leavenworth. Great Grandmother, Norma Blank of Corydon, Aunt, Jill (Casey) Saegesser of New Albany and Cousin, Isaac Saegesser of New Albany, Indiana. 11:00 AM at St. John’s Lutheran Church in Lanesville, Indiana, officiated by Pastor Mark Carnahan. Visitation will be held Tuesday, November 20 at the Gehlbach & Royse Funeral Home in Corydon, Indiana, from 1-8 PM and on Wednesday from 9:00 AM until 10:00 AM. Interment will be at St. John’s Lutheran Cemetery in Lanesville, Indiana. Memorial Contributions may be made to the David Blank Memorial Fund c/o Harrison Co. Community Foundation, PO Box 279, Corydon, IN 47112 or to the Parkinson Support Center of Kentuckiana at 315 Townepark Circle, Suite 100, Louisville, KY 40243-2338. To send flowers or a remembrance gift to the family of Gavin C. Blank, please visit our Tribute Store. "Email Address" would like to share the life celebration of Gavin C. Blank. Click on the "link" to go to share a favorite memory or leave a condolence message for the family.